I've had the day from hell today so I'm writing this post with very tired eyes! We got a film out to watch tonight but then decided we couldn't be bothered to cook so we went for dinner instead. We went to our local carvery and it was really nice. Today I've got a Nails Inc polish to show you. I had a swatching session of all my untried Nails Inc polishes today, so I'll have the rest coming up over the next week, it'll be a Nails Inc marathon! This shade is called Wellington Square and it's a peach creme. The formula on this was good, if a little draggy. I used three coats for the photos below. I didn't use topcoat, this dried really glossy, as I've found with all of the Nails Inc polishes that I've tried. I had a bad feeling when I saw this in the pack I bought, but I liked the other two colours in the set so I bought it anyway. This looks like a darker version of Essie Van D'Go, which I hated and sent back to ASOS after I tried it, so I'm not keen on it. It doesn't look nice against my skin, looks a bit too much like prawn cocktail sauce on my skin tone. My olive skin doesn't do me any favours with colours like this. I think on a paler skin tone this would look so pretty! 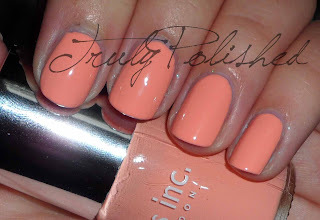 You can buy this shade here at Nails Inc but I bought it as part of a three polish set from TKMaxx which cost me £11.99!